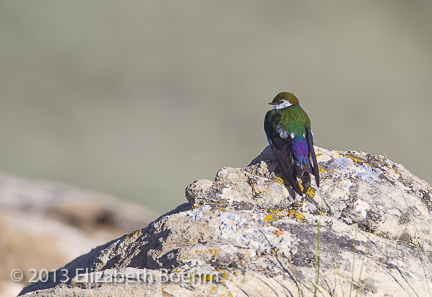 Violet-green Swallows are birds of western North America. This colorful swallow is quite common and likes to nest in a variety of habitats including urban neighborhoods. I have been noticing this bird nesting on rock outcroppings in sage brush areas along with wooded areas in the foothills of the mountains. Violet-green Swallows are so named for the green and violet colors of their feathers which are not always visible but in the right light jump out at the viewer. This swallow, often confused with the Tree Swallow, has a distinct white line above the eye and the rump is white when seen in flight. The nest, made of small twigs, grasses, and lined with feathers, is built in a cavity of a tree or a rock outcropping. I was witness to a swallow carrying in a white feather twice it’s size and it looked as if it was flying with a banner announcing the laying of it’s first egg. It was too fast for a photo but was a memorable sight to see. 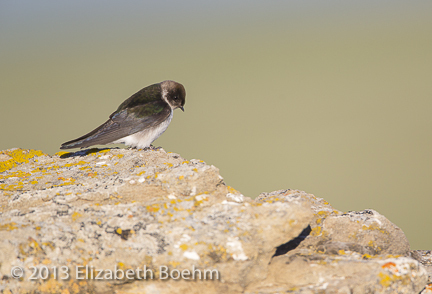 The Violet-green Swallow has a swift, powerful flight which alternates between flapping wings and gliding. It is tireless and very adept at foraging for insects in flight. It will perch frequently to sun or preen itself.